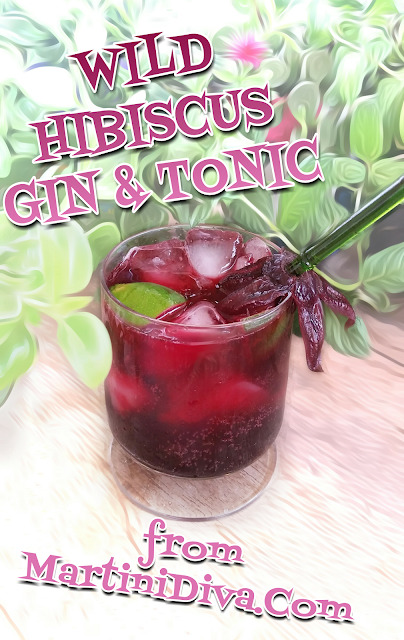 Tea infused gin is a thing lately and, for Gin & Tonic Day (April 9th), I went a little wild with one of my favorite teas and did a Wild Hibiscus Tea infused gin. It was easy to infuse the gin, only took a few hours and I got a fragrant, rich, red colored hibiscus gin for my G&T which I finished off with Wild Hibiscus Rose Syrup and a wild hibiscus garnish. It was a gorgeous, deep magenta cocktail with a tart, citrus and floral taste from the hibiscus rose syrup and fresh limes. Pretty as heck and a great way to bling up a classic gin and tonic, if I do say so myself. DIRECTIONS * Preparation: An hour or two before serving your cocktails add one tea bag of Wild Hibiscus Tea for every one and a half ounces of gin and allow to infuse. Strain and set aside for the cocktails. For each Cocktail: Add the wild hibiscus infused gin to a chilled glass filled with ice. Squeeze in lime wedges to taste, then drop the limes in the drink. Add Wild Hibiscus Rose Syrup to taste, stir then top off with the Fever Tree Tonic Water. 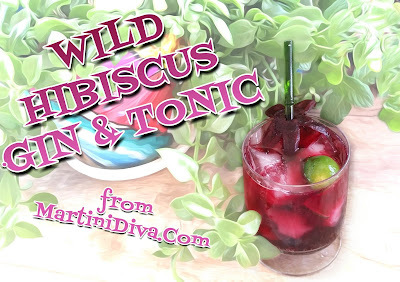 Garnish with a wild hibiscus flower and serve. National, International and/or World Gin and Tonic Day is April 9th.